A lovely view but a bit cold on the bottom! 2013 already and I think I’m a bit late to say ‘happy new year’ so I’ll send many blessings for a wonderful 2013 to you all instead. I have been staying in Durham, in the north of England with my friends Joe and Claire. It’s a very exciting time because they are expecting a human hoglet. Human hoglets are called babies so I’ve been learning all about them so I can be helpful. Hedgehogs have a litter of four to five hoglets after a five week pregnancy. Poor humans take a whole nine months of pregnancy to have one baby although sometimes they can have more. Like hedgehogs, humans like to prepare a nesting site for the baby and this is called a nursery. So I’ve been helping prepare the nursery. Apparently they don’t like compost bringing into the nursery though, although personally I think it would make a lovely warm baby bed. Customs for welcoming the human baby vary around the world including decorating the nursery, giving the baby presents when it arrives and holding a special ceremony to welcome it into the world. According to my research sometimes special adults are chosen to protect the child so, just in case, I looked this up. Obviously I couldn’t be a godmother as I’m a male hedgehog, although I quite fancied the idea of having a sparkly wand and casting a blessing on the baby when it arrives. So I looked up godfather instead which was a bit confusing as I don’t think Joe would like me making anyone who upset the baby sleep with the fishes! These fishes look wide awake! It is so wonderful that Joe and Claire have let me be a part of their family at this very special time. As you probably know if you have been reading my blog I was born at Secret World Wildlife Rescue who do wonderful work in raising lost hoglets and looking after injured hedgehogs. Preparing for Joe and Claire’s new baby has made me wonder if it is time to meet a nice sow, settle down and have hoglets of my own. It doesn’t really work like that for hedgehogs though as we are pretty solitary animals so maybe the settling down bit wouldn’t work! While I’ve been away June managed to get Issue 15 of the Indie Shaman magazine done and dispatched even though I wasn’t there to help. 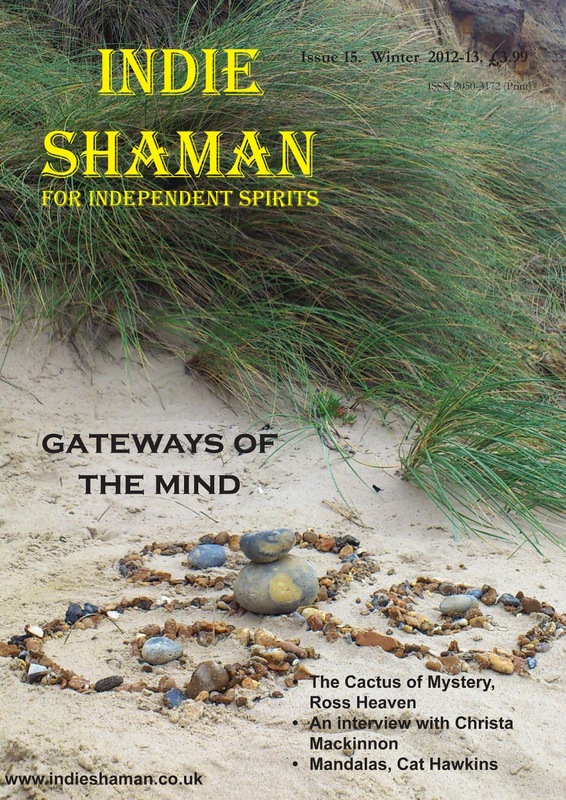 It’s a great edition featuring an interview with Christa MacKinnon, author of Shamanism and Spirituality in Therapeutic Practice, and articles including The Cactus Of Mystery by Ross Heaven; Web of Life: Guidance for your Life Journey by Yvonne Ryves; Northern Plantlore: Asparagus by Eoghan Odinsson; Mandalas by Cat Hawkins; Archetypes in Everyday Life by Judith Stafford and Shedding the Layers by Mark Flaherty. Plus a wonderfully informative article, Gateways of the Mind: Welcome to the Sun of Darkness, written by Paul Baskerville reporting on the Gateways of the Mind Event in London. And of course 50p from all UK subscriptions and all PDF subscriptions is donated to support wildlife including Secret World and Wolf Watch UK. Maybe I’ll be back for the next edition which sounds excellent too with articles from Jim Pathfinder Ewing on Spiritual Eating in the Modern World and an article by John Lockley, an ancestrally trained and initiated Xhosa Sangoma (traditional South African Shaman). June is planning to catch up with John in person as Archetype Events are running a workshop with him in Bristol in June. Archetype Events are also running the LucidExperience in London and Bristol as well as more Gateways of the Mind Events in Dublin and Amsterdam. If you are an Indie Shaman subscriber look out for special offers and discounts coming soon on these events. Following my quick trip into the snow with my new friend its time I was off for a little dreaming of my own again - back to the serious business of snoozing through hibernation. Catch you all again when it’s warmer. Many thanks to my friend Bear aka Rebecca Brown for letting me stay with her in Cardiff. I’ve visited Wales many times yet never been to its capital before. Above is a photo of me by the hyena on Cardiff castle wall. The animal statues were put there by the owner of the castle when he was denied permission to have a zoo! Autumn is here now and the Celtic new year begun. Many slightly late Samhain blessings to all! PLEASE CHECK BONFIRES FOR HEDGEHOGS BEFORE LIGHTING! Cardiff (Caerdydd), the capital city of Wales, is also its largest city and the tenth largest in the United Kingdom. The English name Cardiff derives from the original Welsh name, Caerdyf. Cardiff was granted city status on 28 October 1905 by King Edward VII and now has many national institutions in the city including The National Museum of Wales, the Welsh National War Memorial, the University of Wales and the Millennium Stadium, home to the Wales national rugby union team. So there is lots to see! Luckily you can get a sightseeing bus if you want and Susannah let me sit on her shoulders to save my paws! Apparently something called the Olympics was going on in the Millenium Stadium so I couldn't go in. Here I am by a statue of Sir Tasker Watkins VC, GBE. Born the son of a coal miner, Sir Tasker Watkins was a Lord Justice of Appeal and deputy Lord Chief Justice, President of the Welsh Rugby Union and won the Victoria Cross in World War II. He was very tall wasn't he, as well as obviously very busy and very brave! After all that hard work exploring and learning about Cardiff Rebecca kindly treated me to an ice cream or three from Cadwalders ice cream store. I had strawberry, green tea sorbet and mint choc chip so I could see which one I liked best. The answer was all of them. I’m avoiding fireworks and bonfires totally and on my way to visit Joe and Claire in Durham which is in North East England. Many thanks again to Rebecca and looking forward to meeting Joe and Claire soon. The Indie Shaman Charity Fund was set up in 2008 and each year donates money raised by Indie Shaman Limited and the Indie Shaman Community towards a charity nominated by it's Community Members. In February 2009 Indie Shaman members voted to adopt a Hedgehog from Secret World Wildlife Rescue. I was named Shaman Sham the Wandering Hedgehog by members in March 2009. I like to go travelling, meet new people and learn as much as I can.